The Oracle is a brief but powerful piece which builds to a climax of unearthly energy. Choreographed by Meryl Tankard with performer Paul White, the movement is driven by Stravinsky’s masterpiece The Rite of Spring. Tankard draws on many sources of inspiration, not least the life of Vaslav Nijinsky, the virtuoso dancer and original choreographer of this score. 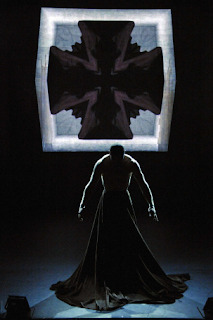 Nijinsky’s battles with mental illness are alluded to through tortured postures and a constant sense of vulnerability, despite the obvious strength of White’s muscular body. The strange landscapes created by Scandinavian painter Odd Nerdrum are also a strong presence. The dark colour scheme, peculiar costume and even distinctive actions such as licking the floor are clearly inspired by Nerdrum’s paintings, so that at times it seems Tankard is meticulously extrapolating, bringing his haunting and mysterious world to life. Régis Lansac’s videography builds the sense of other-worldliness, morphing and manipulating footage of White into images of pagan gods, with unseeing eyes and ever- evolving appendages. The video is also functions brilliantly as a mirror, allowing White to duet with his shadowy reflection. This duality heightens the sense of mental and physical instability, as though the Oracle is at once real and imagined, an elemental force unhappily trapped in human form. White’s physical prowess is astounding, particularly in the explosive final section. Seemingly impossible, gravity-defying leaps inverting and suspending his body horizontally are linked with delicate and detailed spiralling shapes through his spine and arms, distressingly propelled by the dramatic notes of Stravinsky’s score. Combining fine, fluid technique and bombastic power with an impressive stage presence, he is thrilling to watch. Potent, unsettling, and hard to define, The Oracle is a psycho-drama which communicates on a primal level. Tankard is back at her best with this visually ominous and aurally stunning piece.